The best garden courtyard in the country. With its rather unassuming exterior, I spent my first two years in Wellington completely oblivious to what has now become one of my favourite cafes in Wellington. 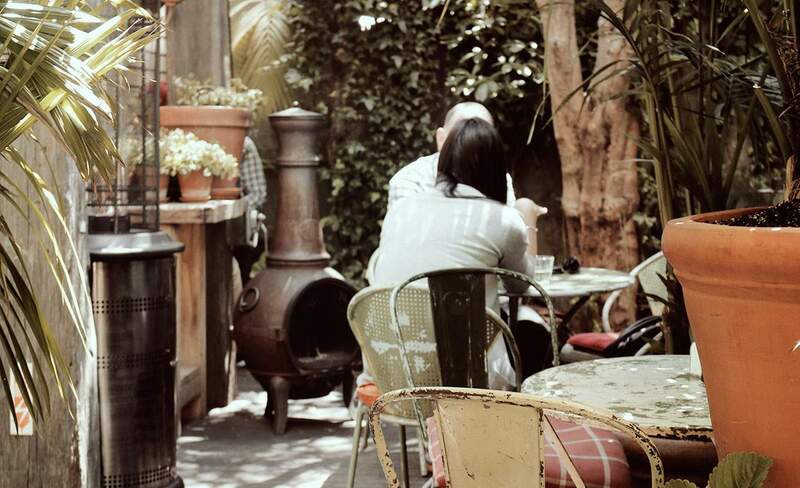 Olive has the best garden courtyard in New Zealand, and a fine menu of food to match. We sat down in the courtyard with a stunning crystal chandelier hanging above us and a lush greenery of plants surrounding us. It felt like our own secret garden in the middle of urban Wellington. On any given sunny Wellington afternoon can you find a few solitary customers hidden in between the leaves and absorbed in some book or another, while groups of other patrons take the main long table, cackling and giving the place its genuine warmth. Olive accepts all sorts. When the time came to order, I - indecisive as per usual - enlisted the help of our waiter, a thirty-something man with a signature Cuba street baby ponytail . His eyes lighting up at the prospect of discussing food. The passionate gourmand had a hypnotic way with words, and described in great detail the intricacies of each dish: the flavours, textures, everything. I could've listened to that man talk about food all day, but being a pragmatic I did finally order after he finished his various sonnets to the menu's dishes. We shared the salmon gravlax with broad bean salsa and avocado puree ($18) for our starter. The avocado was particularly delightful - so much so that we were scraping the edges of the little bowl until we honestly couldn't get any more avocado out of it. The salmon had an amazing lightness to it, which one can only attribute to its high quality and freshness. For my main I had an artichoke and feta cigar, with champagne chicory puree and grilled leeks ($26),washed down with an Elephant Hill Syrah ($13). My friend had the crispy skin market fish, cauliflower, couscous and pickled mushrooms ($32). Up until this point I had always had a slight wariness towards artichokes, something about their texture was always a little bit strange to me. But having our waiter convince me otherwise, I took the plunge and found a new love. There was nothing on the dish I could fault. When deserts rolled in my friend had the classic warm chocolate pudding and vanilla ice cream ($15), while I had the Chai tea panna cotta with sticky date maple pears and butterscotch. ($15) Again, this was at the waiter's suggestion; Chai was another realm of taste I had left unexplored. Again, I was pretty blown away. The panna cotta had a beautiful softness to it, with Chai adding a little spice element to the sweet dish. At the end of our meal our ponytailed waiter came back just to gauge our responses. I can safely say that the man was on the money, every time. Although from what I've tasted so far, I'm beginning to wonder if Olive can do anything wrong.